A painless, effective therapy for Shingles is now available with OUR RAPID RECOVERY SYSTEM. 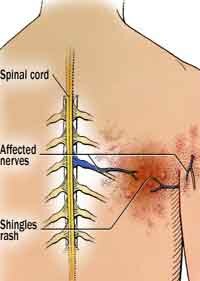 In the U.S. alone there are over 1 million people who develop shingles annually and could possibly experience pain for years or more. Following an outbreak of chicken pox the virus lies dormant within the cells and neural pathways for many years. The virus reactivates under stimulus of stressful conditions, decreased immunity and some medications. A significant percentage will develop a complicated condition called post herpetic neuralgia. Post herpetic neuralgia could lead to severe pain for years. Our light therapy is a non-invasive, pain free, light based therapy that uses a combination of red and infrared light using specific wave lengths. The photons of light are absorbed by the mitochondria in cells and results in an increase of cellular activity. Electron therapy, infuses the body with antioxidants,decreasing cortisol, reduces inflammation and pain. Sound therapy stimulates cells to fight infection and pain. In the case of shingles there have been numerous studies reporting the benefits of light, sound and electron therapy. Our Rapid Recovery will help to prevent the serious complication of PHN (Postherpetic Neuralgia). Our Rapid Recovery provides specific protocols that patients undergoing cold laser therapy will notice an immediate improvement in pain of approximately 20–30% during the administration of the first 3 treatments. During the course of 8-12 treatments, patients usually experience 90-100% relief of pain and other symptoms.